I baked (and cooled) this weeks poll winner; white chocolate cheesecake. I had trouble finding a good recipe for this cheesecake. 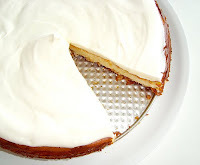 In the end, I went with my go-to cheesecake recipe and made some alterations. 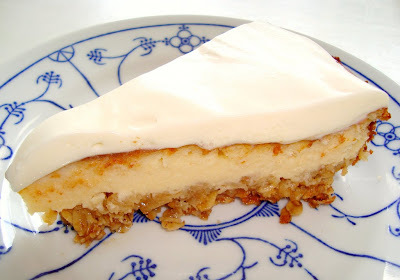 Wanting to shake things up a little (because God knows how many cheesecakes I bake a year), I opted for an oats-crust. Rolled oats, light brown sugar and melted butter. The opinions about the change in crust were divided. As for me, it’s safe to say I have not thrown away my graham cracker-crust recipe. The flavor of the cheesecake was a bit on the sweet side. Usually a cheesecake balances sweet- and sourness. I prefer mine a little sourer! Rating: 3.5 out of 5. - Make filling: Using an electric mixer, beat cream cheese on medium until fluffy, scraping down side of bowl. Gradually add sugar, beating until fluffy. Beat in vanilla, and salt. Beat in eggs, one at a time, scraping down side of bowl after each addition. Beat in sour cream. - Melt white chocolate over a double boiler. Fold in cheesecake batter, working quickly. Pour batter into prepared crust. - Bake until just set in center, about 1 hour. Let cool 20 minutes. Run a paring knife around edge; let cool completely. Cover; chill overnight before serving. - Preheat the oven to 350°F (180°C). - To prepare the crust, cut the butter into smaller pieces and melt over low heat. Let it cool slightly. 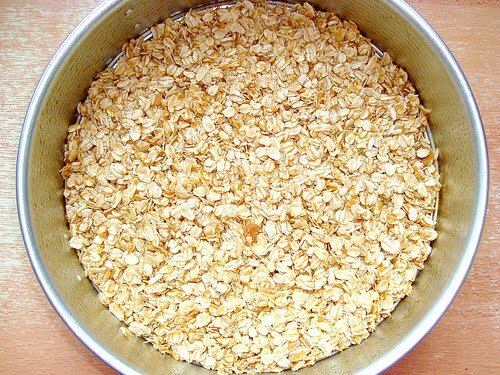 In a medium bowl, combine the oats and the sugar. Add the cooled melted butter and mix to combine. - Transfer the mixture onto the prepared pan and with your hands spread the mixture to cover the base and sides of the pan. Bake in the oven for 10 minutes until light golden. Remove from the oven and allow to cool. The oats crust. I like to call it the “Oats & Caramel Crust”, because that’s exactly how it tasted once it was baked. Diving right in with the first slice. 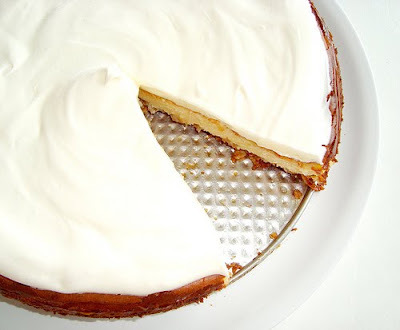 For a white chocolate cheesecake, it sure produced a very dark crust. Whipping cream, cream cheese & caramelized oats - this is no time to be on a diet! I would give anything to be eating a slice of this right now! Looks good! I love infinitely adaptable recipes. Was the oat crust crunchy enough? I'm a bit fascinated by the crust. I wonder if it would've been better to have ground the oats up? Either way, I wouldn't turn down a slice just as it stands. This is such an awesome idea. Like a really fancy rich oatmeal. Can't wait to try it out. I have a few cooking attempts and recipes on my blog reckless bliss, I would love for you to stop by and give me your thoughts! The oat crust sounds interesting. You said you weren't throwing out your standby graham cracker recipe so did you not like this one?